Redistricting House Districts: Using census data within the guidelines established by federal and state laws and federal and state court decisions, the states followed their own procedures to draw new congressional districts for the 2012 elections. That is the second step, following reapportionment, in determining representation in the U.S. House of Representatives. Reapportionment is the process of distributing the 435 Congressional seats among the states after each decennial census. See “Apportionment Legislation 1890-Present” on the Census Bureau web site, and “A Note About Usage: ‘Congress’“. Every ten years, an additional election pressure is added for incumbent candidates for House seats. As required by the Constitution, a census is taken, and seats in the House are then reapportioned by law among the states, based on each state’s population relative to all other states. After the House seats are reapportioned, state legislatures, commissions created by state law, or state or federal courts take over and redraw congressional district boundaries. Subject to federal and state laws and court decisions, including Supreme Court decisions, the body doing the redistricting tries to obtain an equal population in each district in a state. Redistricting goals might include favoring a political party in some of the districts, or trying to accomplish other purposes, such as the creation of districts with a majority of minority population or with geographical compactness. Court cases are used to challenge districting decisions, and several states have redistricted or considered redistricting during a decade. In most states, the legislatures enact redistricting plans, which are then submitted to the governor for approval or veto. Other states use commissions to create redistricting plans. In some states, failure by the legislature to act can send responsibility for redistricting to a commission. Although laws and court decisions govern redistricting decisions, redistricting is a political process. It is particularly painful to congressional incumbents in states that have lost seats. Unless one or more incumbents retire, two incumbents are likely to face each other in a primary if they are of the same party, or in a general election if they are of opposing parties. However, redistricting is also viewed as an opportunity by Democrats and Republicans to strengthen their respective party’s representation in Congress. A party might attempt to add its party’s voters to a marginal district to shore up its strength in that district, or it might add its party’s voters to a district that has favored the other party’s candidates in an attempt to destabilize the district’s voting pattern. The parties might make a deal to create districts favorable to each party or to favor each party’s incumbents. Even in states that gain seats, redistricting can be a problem for incumbents. Where a party controls both houses of the legislature and the governorship, it often uses this power to increase the likelihood of winning additional districts, both existing, albeit revised, and new. In states with commission redistricting, there can be a sense of unpredictability and lack of influence by politicians over the outcome. 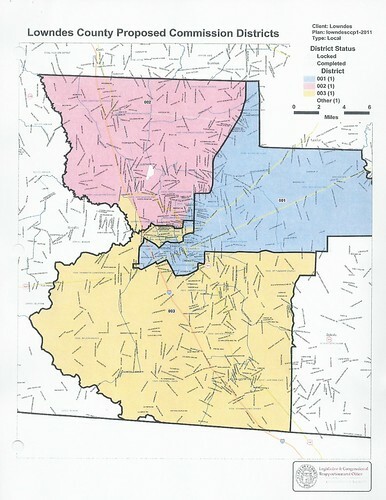 And, the addition of districts due to reapportionment offers additional opportunities for drafting district lines to favor a party, a racial or ethnic group, a socioeconomic group, or another set of voters. Rearranging district lines to assure one political party an advantage in upcoming elections. In 1812, Jeffersonian Republicans forced through the Massachusetts legislature a bill rearranging district lines to assure them an advantage in the upcoming senatorial elections. Although Governor Elbridge Gerry had only reluctantly signed the law, a Federalist editor is said to have exclaimed upon seeing the new district lines, “Salamander! 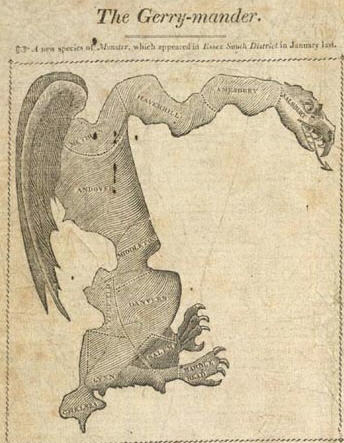 Call it a Gerrymander.” This cartoon-map first appeared in the Boston Gazette for March 26, 1812. Also see Apportionment; District; Mid-Term Election.